If you aspire to be an interest rate trader or a fixed income trader, understanding interest rates is very important. Rates traders, especially those who deal with longer dated (10/30 year), hold some of the more prestigious seats on the trading floor and given the bespoke nature of the product are less at risk of being replaced by machines. However, traders and sellers of all trading products (and investment bankers) should have a solid understanding of interest rates. As a rates salesperson, you need to market to your client that interest rate risk can have adverse effects on earnings or cash flow. For investment bankers, interest rates influence discount rates which in turn influence valuations. We covered the basic theory behind interest rates here and how central banks affect interest rates here. In this article, we will discuss how movements in interest rates are interpreted and rationalized, through an example of an interest rate update. As a new rotational intern or new hire on the trading floor, you will be tasked with putting these rate updates on paper which will be sent out in internal email blasts across the capital markets platform or to clients. An interest rate update typically comprises of 4 important elements: market overview, a reflection on major economic data releases for the period covered, central bank policy, and a look to the week(s) ahead. Any changes in these current events may affect equity and interest rate markets. One mechanism by which the two markets are linked is through a process known as Risk-on, Risk-off. Risk-on, Risk-off (RoRo) is a process where assets are shifted between low risk and high risk investments, depending on the state of global affairs. During times of uncertainty, investors tend to move away from risky assets (stocks, high-yield bonds) into safe assets with minimal chance of capital loss (treasuries, investment grade bonds). This process is known as risk-off, or flight to safety (or flight to quality). When uncertainty decreases, investors move into risky assets to maximize returns in a process known as risk-on. For example, when Trump suggested a 10% tariff on an additional $200 BN of Chinese goods on Tuesday (a risk-on event), investors flocked to 10 year treasuries and pushed yields down. 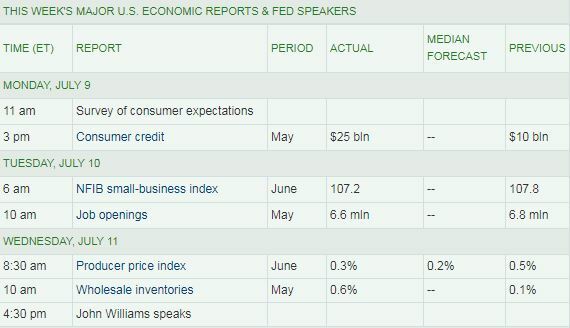 Interest rate analysts will cover any economic data releases that happened in the prior weeks. There are economic calendars that help you track these important figures, and any deviation from their forecast values will move markets. Keep in mind that analysts will also dissect the reasons behind the numbers. If the unemployment rate drops, the market may react positively initially, but if it turns out they are low quality jobs or people left the labor force, rates may end up falling again after the dust settles. Key economic data releases last week included the Producer Price Index (PPI), Consumer Price Index (CPI), Weekly Jobless Claims, and Consumer Sentiment Index numbers. These data releases affect interest rates though many channels, some of which may conflict. For example, if CPI numbers beat estimates, you would expect higher than expected inflation to push up yields. However, you could also expect response from the Central Bank to raise rates, therefore reducing future inflation and lowering yields. The net effect will depend on how investors read these events and their predictions of future actions from the Central Bank. The producer price index (PPI) measures a basket of goods and services that producers sell, which in turn measures inflation. It beat median forecast of 0.2% by 0.1% and prompted a sell-off in treasuries. Higher than expected PPI signals higher than expected inflation, and that translates to higher yield on Treasuries (lower prices) as investors need to be compensated for the loss in purchasing power. The consumer price index (CPI) measures a basket of goods and services that consumers buy (the classic measure of inflation). It was lower than the median forecast of 0.2% by 0.1%. The data came out at the same time as the weekly jobless claims, which was 214,000, significantly lower than the median forecast of 226,000. The negative inflation data would normally cause yields to slip, but the positive jobs data would increase the likelihood of the Central Bank increasing rates sooner. The net effect appears to have pushed up 10-year Treasury yield. The consumer sentiment index data, at 97.1, was lower than median forecast of 98.9. 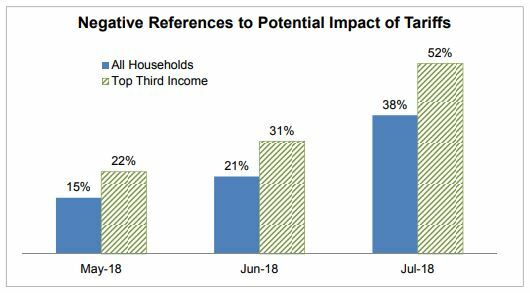 The decline in consumer sentiment was largely influenced by the escalation in the trade war and the negative impacts of tariffs. The decline in consumer sentiment could be a leading indicator for lower discretionary spending, and therefore a slow down in the economy. Yield on 10-year Treasuries slipped in response to the data. Central Bank controls monetary policy, which can have a profound effect on the interest rate market. Therefore, Central Bank statements or FOMC meeting minutes are heavily scrutinized for any read of their intentions. Any change in their forward guidance will influence rates and the yield curve. The Fed presented their biannual Monetary Policy Review on Friday. It highlighted the tight labor market, stable inflation and solid economic growth. In this environment, it called for the “gradual removal of monetary policy accommodation”, through an increase of the federal funds rate. The Fed also reaffirmed the FOMC’s decision to raise target federal funds rate to 1.75% to 2%. 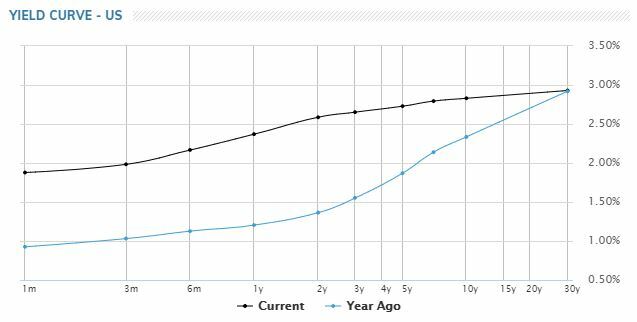 The increasing federal funds rate and the demand for safe assets flattened the yield curve considerably from last year. The yield curve, along with spread between the 10-year and 2-year Treasuries are important indicators of economic health. Typically, the yield curve has a positive slope, accounting for the premium long-term investors demand for the various risks they take on. Inversion of the yield curve (negative sloping) is abnormal and has high predictive power – an inverted yield curve has preceded all of the past 9 recessions. 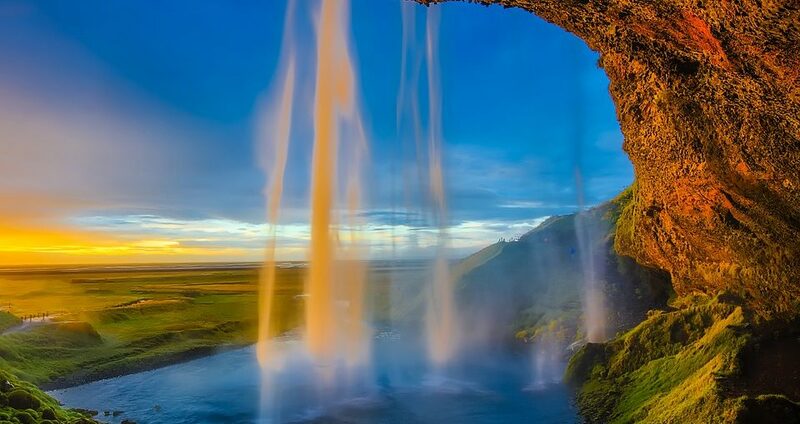 It is important to note that only deviation from expectations will affect markets – if events are unfolding as per expectations, the information has already been incorporated into a semi-efficient market. Do I Need Social Skills to Work in Investment Banking?